Celluloid is a type of early plastics. 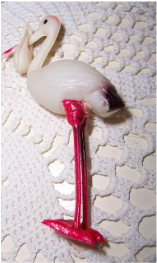 It was first used for dolls by the French in the 19th Century, then the Germans and by 20th Century it was used by the Japanese and American doll makers. 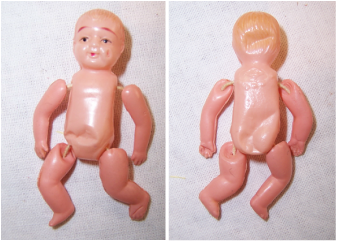 Celluloid dolls are somewhat fragile and are often found dented, cracked or broken completely. 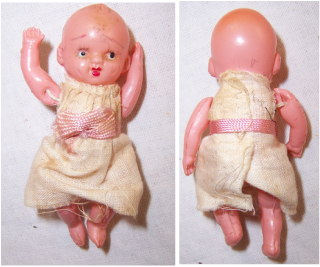 Many of these baby dolls were used for International costume dolls and wore handmade clothing of the country. 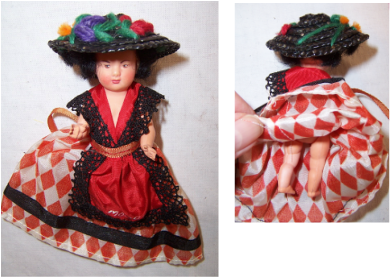 Some of the older International costume dolls were manufactured in their factory made outfits depicting the country they were purchased from. 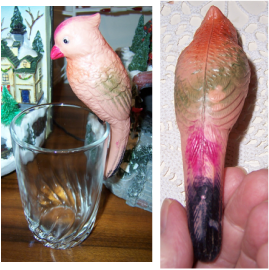 This rare celluloid bird has no dents/cracks or splits. It is still quite colourful. It has weights in the tail area to help it to balance on the edge of a glass or similar item. It is approx 12cm long. It has "Made in Japan" near his black legs, and a triangle with perhaps X inside it. This cute little guy appears to be part of a bride and groom pair. He looks like he is all dressed up to go to his wedding. He has loosely strung arms and may have some light dents to the front of his body. No splits to him. He has "Made in Japan" on his back with a bow type motif inside on his back. He is approx 6cm tall. 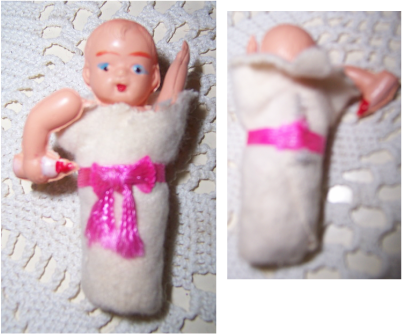 This little doll seems to be wearing her original white cloth with a pink tie around her tummy. She has loosely strung arms and legs, and does not appear to have any dents/splits to her. We are assuming she is :Made in Japan" as we cannot see her back with the cloth covering it. She is approx 8cm tall. 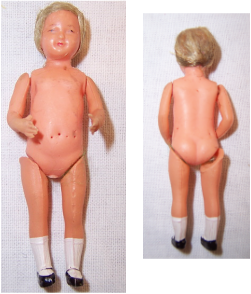 This baby doll has loosely strung arms and legs. She also has dents to the front of the tummy, back and head. She has a triangle on her back with perhaps wording of IS and Made in Japan. She is approx 6cm tall. 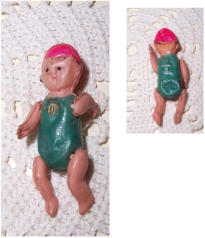 This is a rare baby celluloid doll who is holding onto her baby bottle. She has loos stinging and is in her original baby wrap with a pink ties. She has "Made in Japan on her back. This rare stork has pink legs and a partially pink beak. He is approx 7.50cm tall. He is free of dents but one of his pink legs is broken but cannot be seen by photo and does not hinder it in any way. He would be lovely as a cake topper for a new born baby's cake. "Japan" is written on his side. 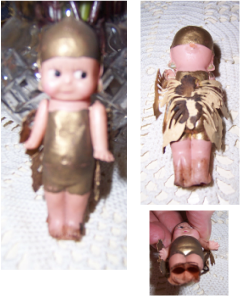 This side glancing cute little gold painted fairy Kewpie appears to be in original condition. She has not dents in her body however the base of her feet has worn away - picture. Her ar,ms are loosely strung. She is approx 7cm tall. Cannot find any makers mark but probably "made in Japan". This baby celluloid doll is quite small. It is only 3.50cm tall. It has Japan on its back. It has loosely strung arms and legs and dents to the front and back of the body. Its body has been painted green, and has a red painted hat. Not sure what country this girl has been made in. There are no markings on her that we could find. Her hair has been glued onto her head. Her arms and legs are strung reasonably tight. There are no dents to her but she does have pin prick marks on her body. This national costume doll has been dressed for the tourist trade of the time perhaps circa 1940/1950. She has stung arms and legs. She is 9cm tall to end of legs but 13cm tall to end of her dress. She is wearing a gorgeous black straw type bonnet with embroidered colourful flowers on top, and has MONACO printed on her red apron. She has no dents or cracks to her. 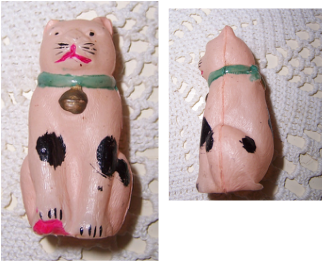 This rare celluloid cat has been very well painted. He has whiskers, pink mouth, collar with medailion, black dobs of colour on his coat, and a pink ball underneath one foot to play a game with. The green collar has a bow at the back of his body. There are no dents or cracks to him just a little pin prick of hole in his base which may or may not suppose to be there. We have not seen one of these celluloid figures before. 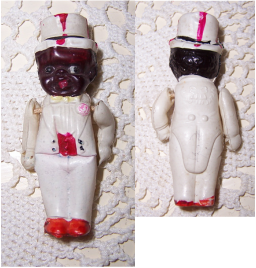 He may have come from a vintage celluloid chess set - not sure. He has a celluloid body but the base of him is lead. When you push him over he springs right back to upright position. 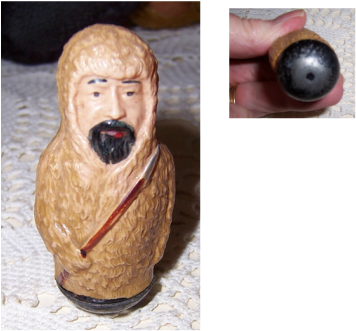 He has a spear in his hand and is wearing a coat with a hood. We cannot find any makers mark on him.